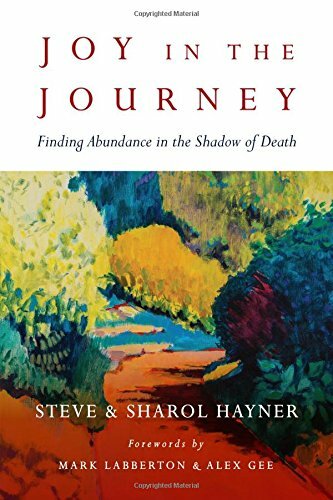 Book Review: “Joy in the Journey” by Steve and Sharol Hayner | J.W. Wartick -"Always Have a Reason"
Joy in the Journey is a collection of reflections from a couple (and occasionally friends and family) going through the struggle with a terminal illness. Steve Hayner was president of InterVarsity, as well as holding a number of other teaching and pastoral conditions. He died of cancer in early 2015. The book is composed almost entirely of blog-like entries into CaringBridge, a web site that allows people to share their journeys through illness. Thus, readers experience the journey with the Hayners as they find out Steve’s diagnosis, realize the disease is terminal, and continue to live their lives. A surprising number of applicable insights are found throughout the posts. One example was Steve’s reflection on “wasting time” and using time wisely in the face of death. He not only outlined some ideas for how to consider time usage, but also stressed the importance of doing things you enjoy, and how relaxation should not just be considered time-wasting. Alongside insights like these is an infectious sense of hope. Steve, Sharol, and friends all display a vision of looking ahead to the joyful life with Christ, and the hope that is brought through reflection on the Word of God. Interspersed throughout the book are poems and hymns, allusions to and quotes from the Bible, and more. These tidbits are not just insights into the hope found in Jesus, but also provide ways to reflect upon grief and joy in life. It would have been nice to include some sort of index or way to find specific discussions within the text. More discussion of some of the comments made throughout the book might have also made it more useful. As it stands, however, it remains a beautiful book that has several insights and reasons for hope all over. Joy in the Journey is a hard read, but one that provides several helpful insights into living–and, sadly but necessarily, dying–well. Disclaimer: I received a review copy of this book from the publisher. I was not asked to provide any specific sort of feedback whatsoever. Steve and Sharol Hayner, Joy in the Journey (Downers Grove, IL: InterVarsity, 2015). Sounds as though it is a moving book. Did they happen to take the title from Michael Card’s song of the same name? A beautiful song which, it seems, would fit this family’s experience well. I don’t see any reference to that song in the text, but I could have missed it.